The new museum, based in Biggin Hill in Kent, is set to open to the public for the first time on the 2nd February 2019. Biggin Hill was the leading fighter station in the Battle of Britain and has become known as Churchill’s ‘strongest link’ due to its strategic defensive role. The new museum will tell the story of the people who served at Biggin Hill, and the community who supported them. Its galleries will follow the story of the site from its 1916 RAF fighter station beginnings, to the end of World War Two, with a particular focus on the role it played during the Battle of Britain. More than 80 exhibits, many of which have been donated by the public, are included in the interactive, multimedia displays that tell the history of one of Britain’s most famous airfields. A diverse array of objects will be on display and will help to bring the personal stories to life. Objects of interest include a 50kg unguided bomb, the Biggin Hill ‘scramble’ and ‘victory’ bells, a Luftwaffe tea set and the table from a local pub that had fighter pilots’ names carved into the wood, among others. Audio guided commentary is available and is included in the ticket price. The tablet guides are led by historian Dan Snow who is joined by the voices of veterans including the late Geoffrey Wellum, who was the youngest Spitfire pilot to fly in the Battle of Britain at just 19 years old. 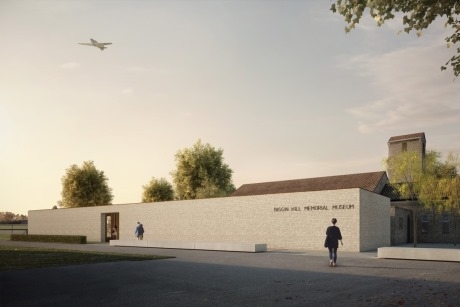 The new museum has also secured the future of St George’s RAF Chapel of Remembrance, which was originally built in 1951 as a memorial to the 454 pilots that were killed flying from RAF Biggin Hill during World War Two. Group discounts are available for pre-booked parties of eight or more and tours of both the exhibitions and St George’s RAF Chapel of Remembrance are available. During a visit, groups are also invited to freely explore the main chapel, gardens, café and shop.